Every year at AMBITION, we like to celebrate our amazing Consultants and their inspiring success stories. 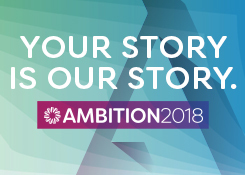 This year, we want you to share your story on about how Ambit and AMBITION have made a difference in your life and business leading up to the big event and then on the big screen at AMBITION 2018. Record a brief (one minute or less) video about your Ambit or AMBITION experience. How has Ambit impacted your life? How has AMBITION helped your business? What is your favorite AMBITION memory? Please make sure your camera is in focus, you’re in a well-lit area, and there’s little-to-no background noise. Post your video to Facebook using #AMBITION2018 or email your video to socialmedia@ambitenergy.com by Monday, April 16. After all, as an Ambit Consultant, you’re the best advocate for all things Ambit on social media. Your passion, experience and achievements speak to your peers and your downline as well as potential Customers and Consultants. Just be sure you review our social media guidelines on PowerZone and refer back to them frequently. And if you haven’t already registered for AMBITION, visit EventCenter and sign up today. We can’t wait to see your videos, and to see you in Dallas!